Trumpf recently showcased the latest generation of its TruDisk disk laser at the Laser World of Photonics trade fair in Shanghai, China. The new laser boasts built-in intelligence and supports Industry 4.0 operations. The ability to carry out condition and trend analyses—also known as condition monitoring and predictive maintenance—is a basic prerequisite for successfully implementing lasers in digitized and connected manufacturing environments. Condition-based services are a modular component of TruConnect, the Trumpf technology for connected manufacturing and Industry 4.0. The services promise to increase the availability and productivity of connected laser systems while identifying potential cost savings. The critical hub of the smart TruDisk beam source is the built-in CPX control system. During processing, a broad array of sensors measures multiple parameters, including laser output, internal and external signal characteristics, the utilization rate of the beam source and the condition of additional components. The goal: Determine the risk of potential laser failure in advance and prevent unscheduled downtime. 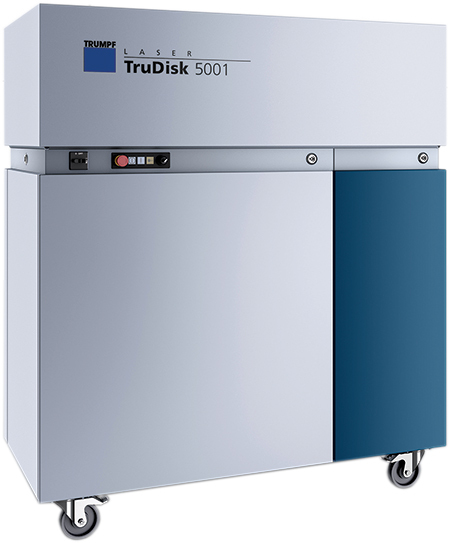 The new generation of TruDisk lasers is available for laser outputs of 3 to 5 kW, with fiber-core diameters of 100 to 600 micrometers.